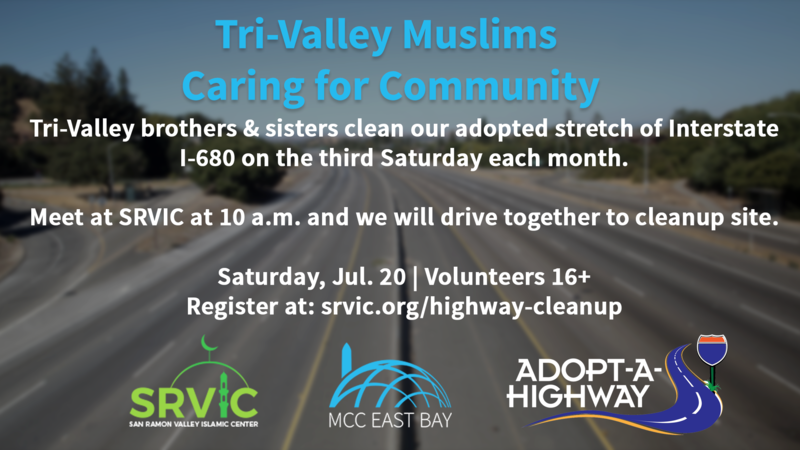 Tri-Valley Muslims clean our adopted stretch of Interstate I-680 from 10 a.m. to noon on the third Saturday of the month. Connect with your brothers and sisters in faith in the Tri-Valley while doing something good for our community. Registration requested (so we know you are coming). Volunteers must be at least 16. We meet at 10 a.m. at SRVIC and the drive together to to pick up litter on our a section of Highway 680 Southbound between the Crow Canyon Road and Bollinger Canyon Road exits. The cleaning can take up to two hours. The more volunteers who come, the less time the cleanup takes. Volunteers must be at least 16. We have heard the Hadith: “And removing a harmful thing from the path is a charitable act.” These monthly cleanups put that Hadith in action and create goodwill in our community by allowing motorists to see their caring American-Muslims neighbors maintaining our roadways. Let’s do our duty. This effort is Tri-Valley Muslims doing good together. Caltrans has put up an Adopt-a-Highway sign with the San Ramon Valley Islamic Center (SRVIC)’s name just before the Crow Canyon Road exit.